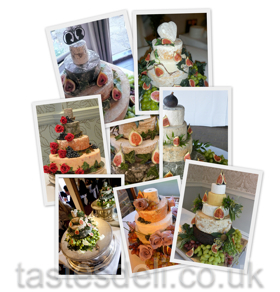 Tastes Delicatessen is an independent, fine food retailer, established by Karen and Jay in 2006. Our deli occupies a pretty, grade II listed, building on the historic High Street in Eton, Berkshire. We are very fortunate to occupy such a wonderful location, between Eton College and Windsor Castle both of which make for great days out and are very close to large areas of parkland and the Thames river bank, perfect for picnicing. There is always something going on in the area, which you can find out about on the Tourist Information web site. So why not make a day of your trip to Eton? Just don't forget to pop into Tastes whilst you're here! Along with all the fantastic foods you can buy from the online deli, in our Eton shop we have a packed deli counter containing cheeses, cooked and cured meats, pate, olives, pesto and much more, along with chilled and frozen items such as cold drinks, milk, ice cream, and nutritious frozen meals. We also have a daily supply of fresh bread, locally grown fruit and veg and free range eggs along with products that sell out before we have time to photograph them for the web site. The town of Eton is about 20 miles west of London and you can find us on Eton High Street about 100m from the Eton-Windsor bridge. Our full address is 92 High Street, Eton, Windsor, Berkshire SL4 6AF. Our telephone number is 01753 641 557. If you are walking from Windsor Castle to Eton College, you'll find us on the left hand side of Eton High Street. If you are travelling by car, we are about half way down the one-way part of the high street, on the right. There is metered parking outside the shop and two pay and display car parks very close by. The location of the car parks and current fees are available on the Royal Borough of Windsor and Maidenhead web site. You can download an A4 map showing exactly where we are in relation to some of the major landmarks, stations and car parks. Or you can find us on online maps such as google maps, streetmap and multimap using our postcode: SL4 6AF. If you are out and about with GPS, you might find us using Lat: 51:29:13N (51.48708) and Lon: 0:36:33W (-0.60919). From the M4 (heading West towards Wales) you can exit at junction 5 and follow the signs for Datchet and Eton. 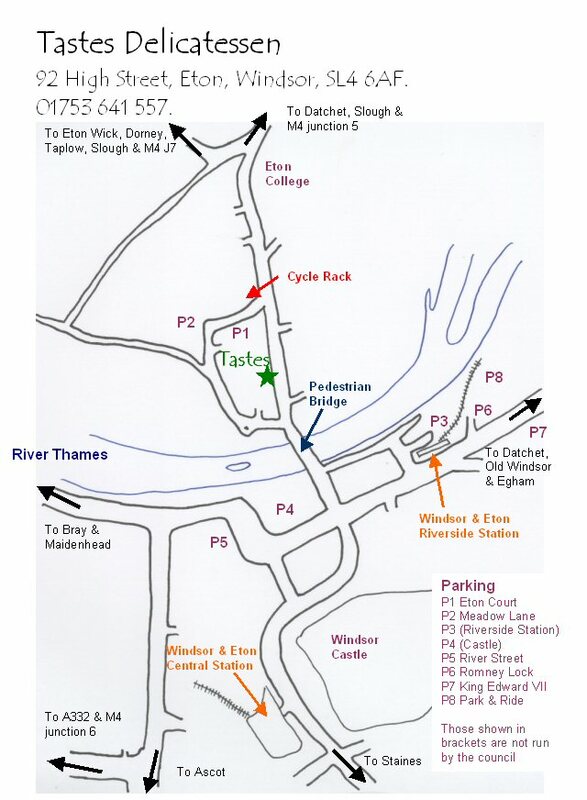 You will arrive in Eton, at the college, and can continue straight along the High Street towards the car parks. From the M4 (heading East towards London) you can exit at junction 7 and follow the signs initially for Maidenhead (left at roundabout), then towards Dorney and Eton (left at next roundabout), go straight through Dorney and Eton Wick and you will arrive in Eton opposite the Eton college chapel. Turn right for the high street and car parks. There are two railway stations within walking distance of the shop (and both are shown on our map). Windsor & Eton Central (WNC) has a First Great Western service to London (Paddington), Maidenhead and Reading via Slough and Windsor & Eton Riverside (WNR) has a direct South West Trains service to London (Waterloo). You can find out train times and ticket information from National Rail Enquiries on 08457 48 49 50. The Greenline coach service number 702 runs between Bracknell and London (Victoria) with a stop on Windsor High Street (opposite the parish church). There are also frequent bus/coach services connecting Windsor to other locations, including Heathrow Airport (departing from the Central Bus Station, above the terminal 1,2,3 Underground Station). The First number 60/61 bus runs between Eton Wick, Slough and Heathrow Terminal 5 (Monday to Sunday) and stops on the high street in Eton. There are lots of beautiful cycle routes which pass through, or near to Eton. The nearest cycle rack to the Delicatessen is on the corner where Eton Court joins the High Street, outside the Austen-Leigh and Baldwin Institute. Tastes Delicatessen is a stone's throw from the Thames and easily accessible from either bank of the river. If you are visiting Windsor or Eton by boat, you will find a public mooring about 70 metres downstream from the Windsor-Eton bridge on the nothern bank. To reach the Delicatessen, follow the footpath upstream, passing between the buildings and onto the High Street, turn right and you'll find us about 80 metres down on the left. There are also paid for moorings on either bank of the Thames, upstream of the Windsor-Eton bridge. Wherever you moor, do pop into Tastes. We have plenty of provisions (fresh bread, milk, eggs, fruit and vegetables) and ingredients for an easy meal on board. If you would like to visit our beautiful town by boat, Salters Steamers operate scheduled boat trips up and down the Thames between Oxford (upstream of Eton) and Staines (downstream of Eton). The Salters mooring is on the southern bank of the Thames, 20 metres downstream from the Windsor-Eton bridge (and less than a 5 minute walk from our Deli). When you disembark, climb the steps onto the bridge and cross over the Thames into Eton High Street. You will find the Delicatessen on your left. For wheelchair access to the bridge, turn away from the bridge when you disembark and turn right onto Farm Yard, then right at the end, and right again. The Windsor-Eton bridge will be in front of you. If you let us know you are coming, we can pre-pack your order or prepare a picnic basket. Then all you need to do is collect it and enjoy the wonderful surroundings.